2. This morning I totally forgot and missed Pearl's 18 month well-baby visit. I was very upset with myself as I am anxious about having her turned-in foot reevaluated... the office staff was, as usual, not very kind or sympathetic. I really dislike that clinic. Our make-up appointment is a month and a half away with a completely different doctor than we saw last time. 3. The bank gave us a loan so we can pay off our credit card debt and nip sky-rocketing monthly payments in the bud, woohoo! 4. I am thinking about checking out the local Unitarian Universalist church. 5. This evening when I was moving some cookies I'd baked from the pan to a platter, I placed them in stacks rather than in a pile all willy-nilly. While doing so I had a flashback to my own childhood - standing at just above kitchen-counter height, eagerly watching as my mother placed hot chocolate chip cookies in stacks, one stack for each of us, three cookies each! 6. Wintry weather is definitely here: the temperature dips below freezing during the night and my husband rides his bike through a frosted landscape to work. The trees that line the backyard have lost all their leaves and the sun sets now as I cook supper, watching the pale pink and blue sky through the lacework of their branches. 7. I love the movie My Neighbor Totoro. Sweet, funny, magical. Beautiful artwork. No violence, the 'bad guy' is a real child's fear - the loss of a parent. This is the first anime I've really enjoyed (though I must admit that my exposure to it so far has been limited to Dragon Ball Z, Pokemon, and Sailor Moon!). I've watched it with Pearl a few times - she seems to enjoy it too. 8. We splurged this year and ordered an organic turkey. We're saving it until the bliss of Thanksgiving turkey wears off, then we'll roast it - on the Solstice, perhaps? 9. A friend of mine from high school is expecting her first baby, and I don't know that our friendship will survive it. Her parenting style & choices are vastly different from mine, and it breaks my heart to think of what her newborn will be missing out on. My mind says that I should respect her choices, but my heart cries out that they are wrong. Read ten more things at Blueberry Pie, and ten more still at My Topography. my friend joined the unitarian church and loves it! #9 must be a common problem - I've just been telling myself to shut up and stop trying to shove my parenting beliefs down my pregnant friends' throats... It seems nearly impossible, but very necessary for the sake of the friendship. I wish I was a bigger person than this. There's a recent post in the Attachment Parenting Blog that touches the same issue. Also, your #10.. I so know what you mean. I have friends who think I'm crazy because I don't think massive amounts of candy, tv, and electronic toys are necessary. 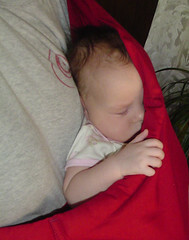 And because, gasp, I co-slept with my baby and nursed him until he was 16 months old. But also, I've learned that people grow immeasurably by becoming a parent. If your friend isn't a parent yet, wait and see what happens when she feels her heart ripped wide open with such vulnerable love. Some of my less progressive friends have come my way asking for advice even after they nay-sayed my entire approach--because they see my kid and see how happy and well rounded he is.. so hang in ther! I recently went to a wedding at the Unitarian Universalist church in Berkeley, CA and it was lovely. We are planning on going back to check it out as well.